New Holland’s new Tier III compliant Series T8000 tractor to become available mid year is set to impress with best in class pulling power, hydraulic capacity and comfort. With four models in the range from 175 PTO to 255 PTO Hp, the Series T8000 which replaces the current Series TG range, is designed to maximise productivity and control in a wide range of farming operations. “When we launched the TG Series three years ago, this flagship tractor pointed the way forward with its styling and functionality. 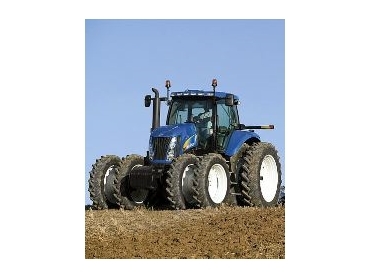 The high-performance T8000 tractors are again leading the way,” New Holland Product Manager, Don Forrester said. While the name change reflects New Holland’s new model naming approach, the unique styling that farmers have come to know will remain the same. “The new name is also reflective of our continued evolution of the tractor range as we strive to provide farmers with innovative new products that reflect their demand for high productivity and power,” he explained. With heavy-duty front and rear axles standard on all models in the range, the Series T8000 leads the industry with three 4WD front axle options – Standard steer, SuperSteerTM and TerraGlideTM. “The SuperSteer axle is ideal for row crop farmers and others looking for optimum turning ability or a long wheel base designed to enhance traction and ride quality, while the TerraGlide suspended front axle provides enhanced traction, stability, control and comfort, making it ideal for contractors and farmers working at higher speeds. The operators ride quality in the cab is also enhanced,” Don said. Industry leading horsepower growth comes via a six cylinder, 24 valve, 8.3 litre engine that actually increases horsepower as it pulls down, providing consistent performance in demanding conditions. “With proven power at the drawbar and plenty of lugging power to pull through heavy tillage, disking and ripping jobs, the Series T8000 responds with up to 56 per cent PTO torque rise and a power growth of up to 44 Hp,” Don said. Eight working speeds are provided from 4.9 to 12.9 kph, with a consistent 14 per cent speed change between gears. “There are also two new transmission options designed to provide farmers with flexible options for a wide range of farming operations,” Don said. The 23x6 powershift with creeper is designed with five slower forward and two reverse speeds for working in vegetable, potato or other specialty crops. The operator can engage and disengage the creeper gears at the end of the rows without stopping. The19x4 powershift has a special gear that increases fuel economy during transport. “All transmissions are enhanced with the convenience of AutoShift™ automatic transmissions features in both road and field modes with the push of a button, providing even more flexibility in this leading tractor series,” Don said. Outstanding weight distribution is ensured with the engine centrally mounted directly to the transmission, guaranteeing optimum tractive performance regardless of the application. Handling the heaviest of implements is easy, with huge three-point lift capacity through the full lifting range, when compared to some competitors who may only offer a high three-point lift capacity when measured midway through the range. “Our three point lift capacity ranges from 7,243 kg to 8,214 kg, ensuring performance regardless of the task,” Don said. A MegaFlow™ hydraulics option delivers an unprecedented 257 Lpm flow to ensure the most advanced seeders and specialty equipment can be operated with ease. Two pumps provide two separate circuits, to allow two systems, such as a low-flow/high pressure system from one remote and a high-flow/low pressure system from another remote, to be operated simultaneously without sacrificing performance. Up to five remotes are available. All models feature electronic engine management for the convenience and fuel savings of setting a constant engine speed or “cruise” control. A large 682-litre fuel tank ensures more time in field before needing to refuel. With the first units expected to arrive mid-May, farmers looking to secure a unit early, are advised to speak with the New Holland dealer fast.